Check-in from 10:15am to 10:45am at Plazoleta Santa Teresa (5 min walk from Main Plaza). There will be a check-in table. The INTI RAYMI TOUR is rated very easy. None the less, you must be able to walk for about 20 minutes comfortably. Our friendly staff will wait for you between 10:15am and 10:45am at Plazoleta Santa Teresa, where you will register at the check-in table with your passport. You will then board the Inti Raymi tour bus that will transfer you to the Inti Raymi venue which is the Inca fortress of Sacsayhuaman. Tour buses will start the 45 min. drive to the Inti Raymi. You also will receive a lunch box to bring to with you as there is no food sold at the event. The tour bus arrives at the Inti Raymi venue where you will go through the official check-point. At the entrance, you will receive the Inti Raymi program booklet that will help you follow along what is said during the ceremony. You will also receive a DVD as a souvenir. Our tour guide will assist participants to their assigned seats. 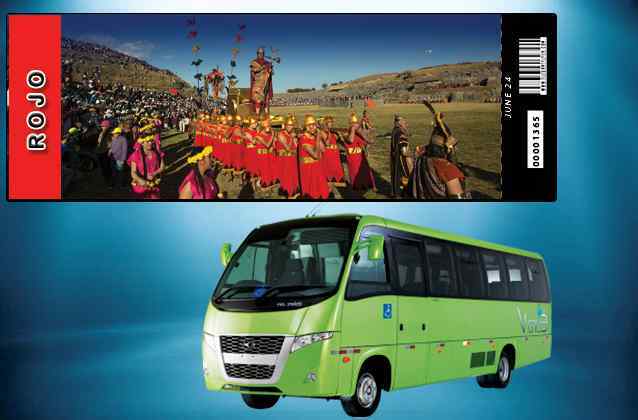 As soon as the ceremony ends, you will be directed to board the Inti Raymi tour bus. The Inti Raymi tour is ONLY available once a year, on the 24th June and advanced booking is required. If during the length of the program, a traveler abandons the excursion due to altitude, health, or for any other reason, no reimbursement will be made and no claim accepted. You agree to cover all expenses made by you due to abandonment of the tour such as meals, hotel, return transportation, medical expenses, etc.